Keith Watson (The Boss) has been 'sparkying' since leaving school and has only got better with continuous training and constantly keeping up to date with ever changing legislation. 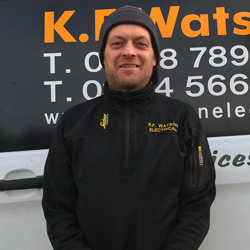 His years of working alone and gaining 1000's of satisfied customers in Aberdeen & Shire over the years has resulted in the business still going strong 15 years later with a team of 8. John Farquhar (Approved Electrician) The go-to man with any sparky issues. John has been a valued member of the team for 10years, which is quite an achievement. We are pleased, that he continues to produce 1st class work and has keen interest in ensuring that as a company we are always up-to-date with the latest certification changes either in legislation or new certification. Andrew Stevenson aka 'Abz' (Approved Electrician) Started with us in 2013 after many years with large Electrical contractors. His experience and relaxed, but hardworking aptitude, has made him the ideal 1st Journeyman for the new apprentices right out of school. Andy has the ideal personality for customers, able to take a cup o tea while he works putting many customers at ease knowing they have a local Aberdeen lad in their home. 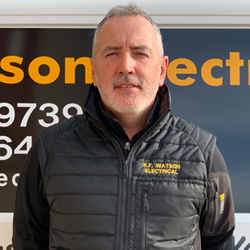 Mark Ross (Electrician) Since coming on board with us in 2015 having served his apprenticeship with another electrical contractor, Mark has developed his skills not only in Electrical Testing, but fault finding in the numerous properties following the EICR's and other installation works he completes. Marks customer care is great with many customers saying how helpful he is. 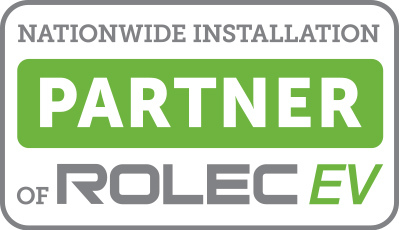 Jordan Groat (Apprentice) Starting with us in September 2014 Jordan's skills continue to grow with the 100s of EICR jobs he has been involved in from testing to tracing and rectify issues. 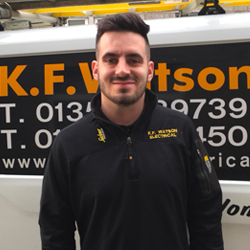 As a 3rd year Apprentice, we hope to offer him more experience by taking control of jobs and using his own initiative with the journeymen taking a back seat, letting Jordan learn, but still having the security of experienced electrician on hand. 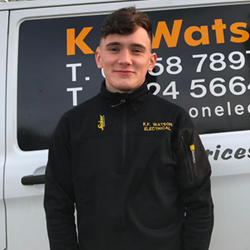 Lewis Robertson (Apprentice) Lewis started his SJIB Apprenticeship officially in 2016 having been employed by us the previous year, meaning Lewis's electrical knowledge and our work ethic was installed in him prior to attending College giving him a head start on many of his peers. Lewis willingness to work overtime with the Electricians ensures he continues to learn. Lewis's knowledge and work ethos means he is strides in front of Apprentices not only in his year, but also many 3rd year students. 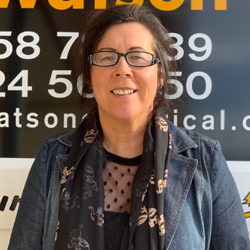 The Real Boss behind the scenes Frances Watson is normally your 1st point of contact when you call K.F.Watson Electrical. Frances will always type up any quotes and have them normally out within 24 hours. This efficiency in providing quotes, has been a valued part of our continued growth in business and recommendations over the years. 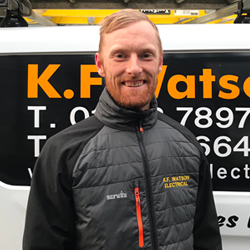 Call Frances on 01224 566450 or 01358 789739 or email us at: frances@kfwatsonelectrical.co.uk and we will get back to you as soon as we can. Frances also deals with all administration for the company, with invoicing & payroll.